Ah, the kitchen backsplash, one of the most difficult areas to remodel. Why? Well there are so many materials, designs, patterns, colors, and many other factors that impact a backsplash remodel. 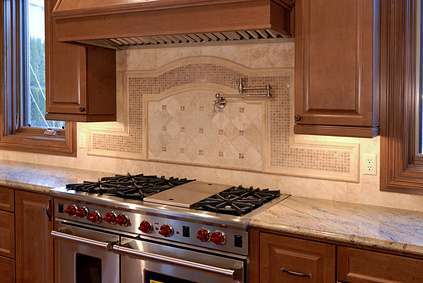 I have been in the remodeling arena for many years and have never seen, or done, the same exact backsplash. I think that's what makes a backsplash so incredible, the possibilities are endless. That's also what makes them so difficult. In the pages of this site I will help you decide on the best backsplash for you, your budget, and your design. These three are what it takes to get you to the all important finale, where the hard work pays off. When it comes to kitchen backsplash ideas the designs are as varied as the people who think them up. Mixing and matching different materials in the backsplash area can add a personal touch that cannot be copied in any other kitchen, because you thought of it yourself. The best way to narrow down the style and design of your backsplash is to find the one that best suits your design. A traditional kitchen will have materials that have an old world feel, such as tumbled marble or mosaic tiles. A contemporary kitchen will have materials that are sleek and non-complex, such as metal tiles and stainless steel. Keeping with the overall style of your kitchen is sure to please. Keeping traditional materials with traditional styles, and contemporary styles with contemporary materials, will bring the whole design together. As you already know there are many different materials available to use for your backsplash area. The design and style of your kitchen, as well as your tastes, is what will influence the materials you will ultimately choose. There are many kitchen backsplash ideas to get you the design and style you want. Have you ever walked down the aisles of one of the big box stores? I'm sure you have, but I bet you were thinking "how in the world am I going to decide on a material let alone the design?" Don't feel bad we've all been there. The best place to start is to pick a color then decide on a material. The color will cut down on the materials you can use, simply because some materials are not available in some colors. For example, travertine doesn't come in any other colors than tans and browns. So this stone would not work in some designs. Don't worry, I'm here to help. That's why I'm creating this site, to help those who need it. Thanks for stopping by! Would you like to share your knowledge about kitchen backsplash? Contribute to www.dream-kitchen-backsplash.com!